Recently, I and my husband granted an interview to Foundation for Family Affairs (FFA). As a result of the feedbacks and various testimonies we've received, I considered it necessary to share the excerpts with you, my blog reader. Below are the excerpts from the intewrview, I trust that God will use it to bless your life. 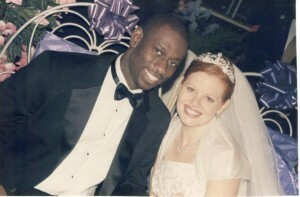 We are Feb and Laurie Idahosa and we’ve been married since 2002. We will celebrate our 14th anniversary this year. 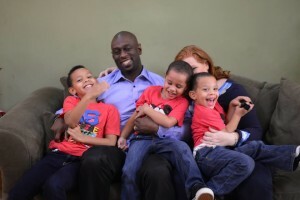 We are blessed with three sons, Feb Jr., Nate and Judah. I am the Bishop over the Headquarters church of CGMI, Faith Arena and the Global Bishopric, comprising of all the new generation churches. I am also the Senior Pastor of one of those branches, Church Unusual, in Benin City. 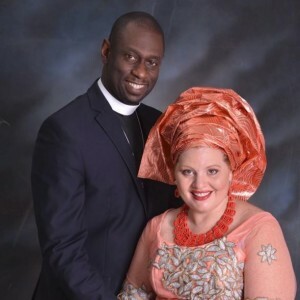 We both work as Administrators in Benson Idahosa University, Benin City, where my husband serves as the President and I serve as the Director of Campus Life. We are the Proprietors of Nathan American Academy and Big Bens Children’s Hospital. We hold many positions on various boards and govern the work that the late Archbishop Benson Idahosa started throughout Nigeria and around the world. FFA: Wow! Great responsibilities you have taken on, more Grace to do more! At what point did you decide to get married and what was the attraction? We met when we were teenagers. You can call it love at first sight because I wanted to marry Feb from the first time I saw him. FFA: Interesting! Wanted to marry him the first time you saw him? We certainly do not get this all the time! We were children and as a child, you don’t have everything organized in your mind, but I always felt that there was something special about our relationship. We had an inexplicable connection and I admire everything about him, from his spiritual life to his intelligence and his ambition. Our attraction to each other has continued to grow past our courtship and continues to grow more passionate, even today. FFA: Hmm… How sweet is that? How did he propose? It was a very beautiful proposal, well-thought-out and very intimate. 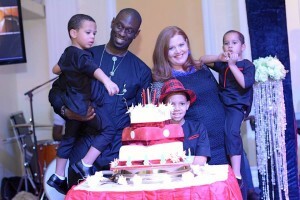 Every member of his family was present in Nigeria for his younger sister’s wedding in 2001. I knew he had a ring for me, so I assumed he’d propose to me in front of everyone. Feb was quiet during the entire event and one by one, members of the family returned to the States and their various countries. I started to worry, thinking that he had possibly changed his mind. One rainy evening, a few days after his sister’s wedding, he asked me if I would walk with him. He walked me through the mud and grass in the fields until we arrived at a palm tree. He pointed out a portion of land and told me that was where he would build his home. Then, all choked up and stumbling over his words, he asked me if I would be willing to marry him and build a home with him for the rest of our lives. FFA: Oh! Hang on please, we need to soak in that effectJ…. Aha! Where were we? …and what was your response? I said yes! We went back to the house, hand in hand, and I had him propose to me all over again with the whole kneeling down aspect as he couldn’t do it outside in the mud. He did and we have built our house on the same field where he asked me to marry him. The palm tree is standing right outside my bedroom window and everyday I see it, I am reminded of his love for me. FFA: Hmm… How sensational! How do you improve on your romance and intimacy? Improving on intimacy is a lifelong journey for every couple. Feb and I have made a commitment to communicate daily. FFA: Awesome, communication is very critical indeed! We are intentional about making out time to be together. We spend a lot of time walking together and during this time, we fill each other in on everything that’s going on in each other’s lives, from the children, to church, to our jobs. We also make sure that we spend time together; we have three very active children, but we still go on dates at least once a week, sometimes more. Another thing we do is to take nights off from everyone and everything to just be alone with each other. We have discovered activities that we both enjoy and we make sure that we do them often. We take out time to just laugh and play with each other, forgetting the seriousness of our responsibilities. The best way to improve your romance and intimacy is to be each other’s best friend. Feb is my best friend. FFA: Awesome! There is so much to learn from your marriage, but one thing that is worthy of note is how deliberate you are about making time to bond. Do you have family routines or rituals that bind you together? Having family routines are important. We have many. We have family meals together on the table and talk about the highs and lows of our day. We also make sure that we are present to handle the academic activities of our children. We stay involved in their lives by taking them to and from school. We also have bedtime routines with our children, taking time to read them a story or a passage from the Bible and pray with them before they go to bed and when we get up in the morning. This particular routine is important because we believe in the scripture that urges us to train our children in the way they should grow. There’s a bunch of family routines we engage in and they are all geared towards strengthening communication and the bond between the children and us. Our children are our priority, above ministry and work. FFA: Hmmm… Parenting must be deliberate to be effective. Can you highlight some of the challenges you have faced as a couple and ways you have been able to navigate through them? Marriage goes through many stages. The first stage of our marriage was difficult; it was tough adjusting from being an independent American to being married to a Nigerian. When we got married, I moved into his family home and it took a while to adjust to the lack of privacy and demands of being a Nigerian wife. I must say that my husband was very helpful towards me as he never took sides against me, regardless of the situation, whether I was right or wrong. FFA: That’s the power of teamwork; a united team can weather any external pressure! Another challenge we faced was with infertility. We were told within the first year of our marriage that we would never have children without medical assistance. This challenge was a big deal to us and a very emotionally draining period in our marriage. Our faith in God was the anchor that held us together and God brought us through this situation to His glory and blessed us with three naturally conceived children. 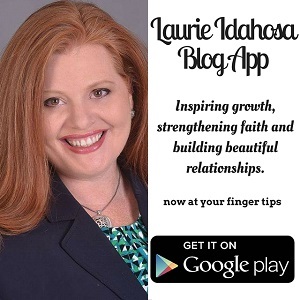 I encourage you to read our story in more detail on my blog, laurieidahosa.com. FFA: Awesome! Now you have three wonderful God’s generals. Indeed, God never fails! Yet another challenge was with finding expression in my spiritual life. I was a very active Pastor and business woman in the States before I got married. 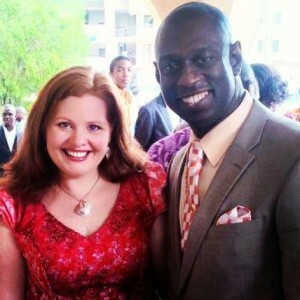 When I moved to Nigeria as Feb’s wife, I was a little frustrated as I wasn’t doing as much of the ministry and life as I wanted to. I wasn’t maximizing my potential. We eventually found different outlets for me to use my giftings and minister in my God-given calling. I pastor a branch of Church of God Mission, Church Unusual and I’m able to combine that with being a supportive wife to my husband who is a Bishop. We’ve been able to marry our roles perfectly and complement each other in ministry and in life. FFA: A virtuous woman indeed, balancing family and ministry. What advice can you give to singles and those who are married? You should make sure that the person you are getting married to is someone you are completely in love with. Don’t marry someone out of obligation or simply because time is running out. Marry someone you are crazy about; loyal to; someone you love with your whole heart; and who you are ready to give your whole life to. Marriage is a choice and should not be forced. We encourage you to choose someone you are equally yoked with, someone who understands and shares your walk with God as well as your values. This is very important because you will make life decisions together in the future. I also encourage you to become friends with your spouse’s family. Go out of your way to build relationship with them and if those relationships don’t work, let it not be because you didn’t make the effort. This is important because family, especially parents, have been a mainstay and the primary influence in your partner’s life for the last 20 or more years. FFA: Wow! There is so much to glean from all you have shared. Any advice to couples going through challenging times? Our encouragement to you would be to hang in there. Don’t give up hope or let go of your faith, that challenge is not going to last forever; it’s just for the moment. Keep your disagreements between each other and God and do not involve unnecessary third parties who could amplify the situation. We encourage you to be sold out in love to each other. Finally, marriages don’t work by DEFAULT, you must put in effort to make that marriage work, it is YOUR MARRIAGE. FFA: We feel honoured to be bringing your fantastic story to the world! What a blessing you both are! Thank you so much for sharing your romance story. Thank you for having us on this platform and for allowing us to take part. Great answers. May God continue to bless your marriage, family and ministry. Thanks for sharing.